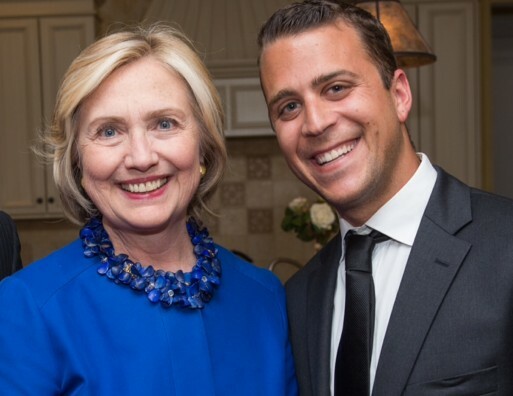 Todd Robbins, ’11 (right), Director of Operations and Facilities at North Shore Day Camp–TLC Family of Camps, Long Island, New York with former Secretary of State and presidential candidate, Hillary Clinton. Todd Robbins, ’11 has had quite a journey since graduation just five years ago, from working in Orlando’s nightlife scene to planning events for a presidential candidate. In his own words, he shares how his undergraduate experience prepared him to conquer change and new challenges. Can you describe your career journey since graduating from UCF’s Rosen College? I’ve been keeping busy since graduating in 2011! During my last semester of college and the following year, I worked as the assistant general manager of a bar/club on the east side of Orlando where I met my wife, Jessi, who also worked there and is a 2013 graduate of UCF’s Rosen College. Shortly thereafter, I got a job as a front desk agent at Rosen Shingle Creek Hotel. Shingle Creek is a great stepping stone for all Rosen College students. While working at the hotel, I was contracted to manage the artist and press-only yacht at Ultra Music Festival 2013. Now, that was an experience! As time went on, I needed a change; a big one might I add. I resigned from my position at Shingle Creek, and Jessi and I packed up and moved to New York together. We both took summer job positions at Tyler Hill Camp in the Pennsylvania Poconos. That summer, I worked as the assistant food service director, helping oversee food service for 800+ people for the 51-day season. Without being aware, the position at Tyler Hill turned into the interview of a lifetime. My every move that summer was part of the “interview process.” I was introduced to Tyler Hill’s executive director midway through the summer while I was on a visit to Timber Lake Camp, his home base. We had a quick conversation and once the summer was over, I went in for a formal interview. A few months later, I accepted a position working full-time at North Shore Day Camp and have been there ever since. I have been able to utilize the many skills that I learned in my communication and management classes at Rosen and apply them daily when talking to parents, staff and campers, along with overseeing different departments at camp. Almost three years into the position, I’ve had the privilege of planning many events for our “off-season” business. Among those events were several fundraisers for former Secretary of State and presidential candidate Hillary Rodham Clinton, one of which I am currently in the process of planning. The event is expected to host more than 500 guests, including high-ranking political officials, celebrities and fortune 500 CEOs. What’s your favorite thing you’ve been able to do so far in your career? It’s hard to choose a favorite. I truly enjoy each and every part of my job! I think one of my favorite things so far in my career is to be able to walk around the property and reflect, “I had something to do with that project” or “Wow, that was a great thing I was a part of.” As we continue to build and update our property, it’s great to see what changes have been implemented since I’ve been on board. Every change allows for a better summer for each and every one of our campers, which is what matters most! How did your experience at Rosen College prepare you for the industry and your current role? I began my first year and a half at UCF as a Finance major with a minor in Marketing. I’m glad I made the switch. As a hospitality student and employee, you are given the opportunity to put a smile on people’s faces. This is something I just couldn’t resist. Learning from professors with 15+ years of first-hand experience at great companies, such as Disney and Universal, is also a plus. I was exposed to topics that I never thought I would need to know or use in everyday life, but that was proven untrue. I keep the tools from Rosen close to my heart; they helped me grow as an individual and gave me the tools needed to work in the hospitality industry. What was your favorite part about attending Rosen College? One of my fondest memories is driving to and from UCF’s main campus with my friends listening to music and enjoying the beautiful weather. In all seriousness, my favorite thing about Rosen College was the small, tight-knit classes and community. You feel that everyone cares from the first time you step on campus. Unlike a lot of my friends at other colleges across the country, I had the ability to talk to my teachers whenever I needed something. They gave feedback on a more personal level rather than via e-mail or office hours. I liked that. I enjoyed that the professors knew my name and I also enjoyed having classmates who were similar, like-minded individuals who were there to learn about the hospitality industry. Do you think your degree gives you a competitive advantage compared to your peers? How so? I really do believe that having completed courses like hospitality communications, hospitality finance, restaurant management and even the sanitation course gave me an upper hand. I was able to understand how to communicate more effectively with individuals in the business world as opposed to someone who went to school for accounting and learned solely the art of accounting. I was able to take many of the tools I learned at Rosen College and implement them into my job. What advice would you give to current and potential Rosen College students? I would tell them not to take it for granted. Not one bit of it. If you get the great opportunity to go to Rosen, you are putting yourself in a great place. Rosen was recently listed as one of the top five hospitality programs in the WORLD. The school deserves it. As I said before, the administrative staff and professors genuinely care about each and every student. UCF is a phenomenal university, so be sure you support its athletics and go to class. It will only help the school continue to grow and develop into an even better institution than it already is! To meet other Rosen College alumni and find out what they’ve been doing since graduation, please visit hospitality.ucf.edu/our-alumni. On March 3, the UCF College of Sciences and its alumni chapter hosted their second annual Outstanding AlumKnights awards ceremony. The college’s dean, Michael Johnson, hosted this year’s festivities, which took place in the Grand Ballroom of the UCF FAIRWINDS Alumni Center, where guests enjoyed music, cocktails, heavy hors d’oeuvres and a photo booth, in addition to the award presentations. Congratulations to all of this year’s Outstanding AlumKnights! Chemistry | Robert DeVor, Ph.D., ’03, ’08, scientist/principal investigator, Vencore Inc. Political Science | Carol Lawrence, ’71, attorney at law, Carolyn J.B. Lawrence P.A. Nearly 70 UCF alumni gathered for an evening of professional networking on Jan. 21. Alumni chapter volunteers from the College of Business Administration, College of Engineering and Computer Science, and College of Sciences partnered to host the event, which took place at the law offices of GrayRobinson in downtown Orlando. While guests mingled with other professionals from a multitude of diverse fields, Dean Paul Jarley (business), Dean Michael Georgiopoulos (engineering) and Dean Michael Johnson (sciences) each addressed the group of Knights, speaking on the importance of networking, mentorship and advancement. It was a great Networking Knight to kick off 2016! Charles Gray, founding director of GrayRobinson, played an instrumental role in the history of the University of Central Florida. Gray was honored by the UCF Alumni Association in October with the 2015 Champions Award for his continuous support and advocacy for the university. Every business starts with a great idea, but connecting and networking with the entrepreneurial community is what gets it off the ground. That’s what Julien Meyer, ’14, hopes students will take away from the Rosen College Entrepreneurship Competition, an idea he originally brought to the college, which officially launches in January. Meyer studied hospitality and event management at UCF while running his own startup company, but, since graduation, his newest venture has really picked up speed. Meyer is currently CEO of BlurtBox, a mobile app that helps customers voice their complaints about a business, and allows owners and managers to address customers in real time. While the technology sector may seem crowded, BlurtBox has already racked up a list of impressive achievements, surpassing 10,000 downloads in the Google Play and Apple App stores since its Aug. 25 launch, raising $125,000 in funding and averaging more than 200 new business customers weekly. Meyer and Blurtbox show no signs of slowing down as they seek a second round of financial support to hire employees and grow the company. At the age of 23, Meyer clearly has a lot on his plate, but he finds time to pursue another passion besides his business — helping others realize their entrepreneurial dreams, too. As a recent graduate, he’s now a member ofRosen College’s Hospitality Management Industry Advisory Board, which is how he initially introduced the idea of an entrepreneurship competition. His experience at UCF inspired him to become an entrepreneur, which is why he believes it’s important to expose students to all the resources the university community has to offer. The Rosen College Entrepreneurship Competition will be an opportunity for students to take an idea for a hospitality-related product or service and develop a plan to bring it to market. Students may enter as individuals or teams, and at least one person must be currently enrolled at Rosen College. Participants will compete for cash prizes that can assist with startup costs and help make their dreams a reality. Full details about the Rosen College Entrepreneurship Competition will be announced in early January. See original article on UCF Today. For more information about hospitality education at Rosen College, please visit hospitality.ucf.edu. to families staying at the Ronald McDonald House. Since 2007, students, alumni, faculty and staff have served more than 22,000 hours at UCF’s annual day of service, Knights Give Back, making a lasting impact on the Central Florida community that will continue to grow, and saving Orlando nearly $600,000. The Chicago UCF Alumni Chapter prepared and served dinner to local families staying at the Ronald McDonald House. The Dallas/Ft. Worth UCF Alumni Club held a clothing and food drive benefiting The Bridge Homeless Recovery Center during its UCF at Tulane Watch Party. The Denver UCF Alumni Chapter held a canned food drive to benefit the Denver Rescue Mission. The Jacksonville UCF Alumni Club collected school supplies and non-perishable food items for the John E. Ford K-8 School and Ft. Caroline Elementary during its UCF at Tulane Watch Party. The Ocala UCF Alumni Club held a children’s book drive, which benefited Kimberly’s Center for Child Protection, during its UCF at Tulane Watch Party. The Palm Beach UCF Alumni Chapter collected items supporting the Peggy Adams Animal Rescue League during its UCF at Tulane Watch Party. On Oct. 25, the Space Coast UCF Alumni Chapter will be cheering on runners, manning water stations and helping to collect new/used running shoes to donate to local nonprofits at the Cocoa Beach Half Marathon. On Nov. 21, the Southeast Florida UCF Alumni Chapter will be sorting through food before it gets donated to local food pantries through Feeding South Florida. The Tallahassee UCF Alumni Club collected non-perishable food items to benefit the Big Bend Homeless Coalition. The Volusia/Flagler UCF Alumni Club partnered with UCF Daytona to paint the PACE Center for Girls, which provides girls and young women an opportunity for a better future through education, counseling, training and advocacy. The Washington D.C. Alumni Chapter sorted through food, donated by local farmers’ markets, for the Arlington Food Assistance Center, and helped organize bundles for local families. In addition, the UCF College of Sciences Alumni Chapter helped the efforts of Pegasus Professor Linda Walters, Ph.D., to restore degraded shorelines and oyster reefs at the Indian River Lagoon. The UCF Rosen College of Hospitality Management Alumni Chapter also helped out at the Pet Alliance of Greater Orlando, a nonprofit animal shelter that takes in owner-relinquished pets. Through Pet Alliance, each animal is ensured to have a good quality of life and is provided with enrichment activities, socialization and exercise. Plus, UCF Alumni Relations hosted a clean up at Orlando’s historic Greenwood Cemetery, where volunteers cleaned headstones, grave markers and memorials, removing debris, as well as doing some painting and landscaping. Volunteers now have a new way to make an even greater impact, with a grants program called “Dollars for Doers,” in which some employers will honor your work as a volunteer by “matching” your efforts with a charitable donation of their own, often to the organization of your choice! Greg Fisher, ’07, has what philanthropist and hotelier Harris Rosen famously calls the “entrepreneur gene.” He saw his first business succeed and fail while still studying hospitality management at Rosen College, but persevered and eventually launched TripShock, an online booking agency for tours, attractions and lodging for the Southeastern United States. The company reported record sales of $2.4 million in 2014 and a three-year growth rate of 2,386 percent. His company recently ranked No. 173 on the Inc. 5000 List of Fastest-Growing Private Companies in America. Fisher, who serves as TripShock’s CEO and oversees employees working remotely around the country from his Destin, Fla., headquarters, shares his advice for budding entrepreneurs and how his experience at Rosen College has played a part in his success. Describe your career journey since graduating from UCF’s Rosen College. I started out working in various hotels in the Destin, Fla., area for my first two years after graduating. At the same time, I had been running an online dining guide that I started while attending Rosen College. Although I enjoyed the challenge of both jobs, I was looking for something that defined my passion for tourism innovation. I was lucky enough to run into a local businesswoman for whom I had worked in the past. She needed someone with my skill set to operate a concierge business she planned to open. As most entrepreneurs do, I took a risk of leaving a safe and secure job for a startup. For the first four years, we dealt with a lot of challenges, including the BP oil spill, which nearly shut our doors. In 2014, I acquired majority ownership of the company and took on a new partner. While attending Rosen, I started an online dining guide that entered me in the world of entrepreneurship at 20 years old. I ran the dining guide as a hobby while holding other jobs, but the success and failure of this venture prepared me for what was to come with TripShock. What intrigued me most about entrepreneurship is allows you to solve problems for consumers on a personal level. When I realized that tourists were not able to effectively find and purchase tickets for tours and attractions on the Gulf Coast, I knew I needed to provide a means for them to do this. What makes your company stand out from others in the online booking space? Although there are a handful of local, regional and national competitors in our space, TripShock stands out because we have not given up on the traditional aspect of the booking experience. Where most online agencies have outsourced or removed their call centers completely, we have done exactly the opposite! We have invested in local and professional agents that greatly enhance the customer experience with their knowledge of our booking destinations. In fact, more than 30 percent of our revenue has been generated from our vacation planners, which far outweighs any additional costs of hiring local. Another reason for our growth is attributed to an experienced management team that understands seasonal pricing trends. It’s important to structure promotions and packages at the right time in order to maximize engagement. We only concentrate on the northern Gulf Coast because we have greater control of our resources. We are very thankful for the close partnerships we have made with the 130-plus suppliers in our markets. My favorite thing I have been able to do is give back to my community, employees and colleagues, and enhance their lives in some way, shape or form — whether it be giving to a local charity, or providing assistance to an employee in need. If your desire to become an entrepreneur is to get rich and have nice things, you are in it for the wrong reasons. It will never be fulfilling until you realize that what you’re doing is helping make someone’s life (or vacation) better. How did your experience at Rosen College prepare you to start your own business? Although Rosen College didn’t offer many classes on entrepreneurship or online travel marketing, the faculty did a great job of inspiring students to pursue something “greater.” More than anything, I enjoyed hearing how certain professors made their mark on the hospitality industry. It made you believe that nothing can stop you from starting your own restaurant franchise or becoming the next Harris Rosen! There were so many great memories that it’s hard to pinpoint my favorite. I’d have to say being around like-minded individuals who equally inspire each other tops the list. Many of my peers from Rosen College are having a lot of success in their careers, which is important for the reputation of the college. How has your degree helped you as an entrepreneur? Although Rosen College didn’t offer many classes for entrepreneurs, a lot of faculty were current or past entrepreneurs. The stories of their success and failure were always intriguing and helpful. The degree has opened up many doors throughout the years and brought credibility to my company. What’s next for you and TripShock? We have a lot of exciting things in the pipeline right now. Our latest initiative is developing a cloud based app for tour and activity operators that allows them to accept online reservations from several different distribution channels, including their own websites. This project is slated to go live in October. We are also in the process of licensing our booking software to other local travel entities, so we can reach a greater audience with our products. There are no immediate plans to expand our territory since we have a lot more growth opportunity locally. What advice would you give to current and potential Rosen College students who are interested in starting their own business? I would say that there is never “the right time” to start a business. If you have an idea that you want to pursue, go for it. It’s OK to make mistakes and prepare to have major setbacks — it’s all part of the ride. People will tell you that “you won’t go far” and “your idea is terrible.” The worst critics will be your closest friends and family. Surround yourself with people who are highly motivated, passionate and like-minded. Most of all, lead by example! Stephen Lambert, Ph.D., associate professor for medicine in the UCF College of Medicine, presented the first MedTalk, “The Cannibal and the Railway Worker’s Wife: Why Your Brain Gets Sick,” on April 22 at the Downtown Pour House. The series, a partnership between the UCF College of Medicine and UCF Alumni Association, will continue in the fall. Since April, the UCF College of Medicine and UCF Alumni Association have partnered to host a monthly series of MedTalk events. These informal discussions allow attendees to hear about current and innovative issues in medicine, all in plain language and a casual setting, where a researcher or physician gives a brief presentation, followed by a Q&A session. “The Cannibal and the Railway Worker’s Wife: Why Your Brain Gets Sick” (presented by Stephen Lambert, Ph.D., on April 22), which covered how our brains get sick and what we can do to maintain brain health, and what works and doesn’t work with some of the most debilitating diseases we face today as a society of people living longer than ever before. “Wine, the Sun and Food: Keys to a Long Life” (presented by Dr. Sampath Parthasarathy on May 13), which covered what’s going on in laboratories around the world and answered the questions: Is all wine equal? Are there foods that can harm you? What can sunlight do? “The Upshot of Viruses and Vaccines” (presented by Dr. Griffith Parks on June 17), which covered why viruses are among the most deadly known diseases of mankind, including smallpox, measles and the influenza virus, as well as what viruses are and why they’re hard to control, how vaccines are made and why you need to get them annually, and where all these new viruses are coming from. All of the events are free and take place at the Downtown Pour House. The series will pick up again in the fall. framed photos of the Reflecting Pond as a token of thanks for all of their hard work and dedication to the UCF Alumni Association. On Saturday, June 13, following the previous evening’s 8th Annual UCF Jefferson Awards & Alumni Volunteer Reception, nearly 60 regional, college and special interest chapter and club alumni volunteers — from Central Florida and across the nation — attended the UCF Alumni Association’s AlumKnights of the Roundtable: 2015 Chapter & Club Council at the UCF FAIRWINDS Alumni Center. The morning began with a keynote address and Q&A by Anthony Jenkins, Ph.D., UCF’s senior associate vice president and dean of students. The College Chapter Challenge Award tasked college-based alumni chapters to engage in professional development activities within their chapters that add value to their degrees and make meaningful connections back to the university. This year’s winner hosted an evening to provide alumni with a tool that’s invaluable in the industry in which they work — customer service training, provided by best-selling author Tim Miles. Congratulations to the Rosen College of Hospitality Management Alumni Chapter! The Regional Chapter/Club Challenge Award tasked regional chapters with executing events with a strong university connection — which isn’t always easy when you’re not in Orlando! However, this year’s winner impressed the selection committee by working on events with local businesses in their community, while also working with the UCF regional campus closest to them on their signature event, Starry Knights. Last year, Starry Knights raised more than $6,000 for scholarships and, after this year’s event in July, they will be one step closer to their goal of endowing their chapter’s scholarship. Congratulations to the Space Coast UCF Alumni Chapter! The Constituent Chapter Challenge Award tasked special interest chapters with creating opportunities to create meaningful connections with our student population. Chapter volunteers participated as panelists for the 4EVER KNIGHTS Alumni Speaker Series and served as mentors in the 4EK Connect program. Their signature professional development conference, PRO CON, raised $8,000 this year and allowed the chapter to engage with students in various stages of the UCF experience. Congratulations to the UCF Young Alumni Chapter! The Chapter or Club of the Year Award was presented to the overall chapter or club that covered all of the bases in not only event programming, but in communicating with alumni and building meaningful connections. The selection committee was impressed by the winning group, not only for their philanthropic events — participating in multiple events through the year in addition to UCF’s annual day of service, Knights Give Back — but also in the goals they set and how they reached them. They’ve grown their LinkedIn following from just 10 members to nearly 300, while becoming a chapter only two years ago. The judges were thoroughly impressed! Congratulations to the Denver UCF Alumni Chapter! Chapter and club leaders then participated in breakout sessions on the alumni association’s strategic plan goals of communication, engagement, relevance and funding. After lunch, they continued with roundtable discussions on board management, social media, student engagement, professional development/career-focused events, and partnerships. Before wrapping up the day-long conference with a catered happy hour and UCF Bookstore merchandise sales, attendees got to meet and participate in a Q&A with Mike Morsberger, the new vice president for alumni relations and development, and CEO of the foundation. Thank you to all of our dedicated alumni volunteers! Go Knights! Charge On! Ever wondered what it takes to keep the world’s most luxurious resorts running smoothly? The answer is a lot of hard work, dedication and very special people. Because they work where everyone wants to vacation, these individuals are charged with a unique yet challenging mission: to make vacation dreams come true. Six Rosen College graduates working at the Four Seasons Resort Orlando and The Breakers, two world-renowned luxury brands, offer an inside perspective on how the hospitality industry’s finest resorts create unforgettable and unparalleled guest experiences every day. What attracted you to joining Four Seasons Resort Orlando/The Breakers and becoming part of their team? Rivera-Florez: What really attracted me the most was the fact that I get to be a part of history in Orlando with the first Four Seasons in the area. In the future, I want to be able to open hotels and be a part of new teams and experiences and this job has given me that opportunity. Strout: I always wanted to be a part of Four Seasons and an opening team, and it was a bonus that this hotel was in Orlando – an area that was not only familiar to me, but also in the hospitality mecca. Orlando is such an amazing city because you are surrounded by the most amazing talent and have the opportunity to experience guests from all around the world. I knew it was a once in a lifetime opportunity! Staub: I wanted to be a part of the best hotel and team in Orlando, and I wanted to learn from the best! Rosar: Whether things are positive or negative, an organization finds its destiny with the attitude and drive of its leadership. In this case, the passion and love for the industry from the leadership, along with their positive attitudes keep associates happy and motivated! Shook: From the age of 16, I recognized what The Breakers had was truly special. The team’s passion for what they do and the family culture they’ve created exudes from each employee. Patel: Our General Manager Tricia Taylor came to speak at Rosen College in the fall of 2010. During her presentation, she really stressed the family culture at The Breakers. Company culture was always the most important thing for me when I was looking for a job. It was The Breakers’ culture, history and brand reputation that influenced my decision to choose the team. How do you think the luxury travel segment is different from others from the perspective of a hospitality professional? Does it require different skills or strengths? Rivera-Florez: Guests in this segment of travel really expect a level of service that has to be perfectly executed and that is definitely a skill by itself. Employees have to be extremely knowledgeable about their job and property. Patel: The luxury segment is all about creating lasting memories for our guests through personalized, proactive service and focusing on the small details. The segment is always leading the way, introducing new and innovative ideas to serve guests. In order to succeed, you need a team that is familiar with all industry segments and can demonstrate high attention to detail, exhibit creativity and adapt to constant change. Strout: Any hotel can make a bed properly or have clean dishes, a nice pool and more, but what sets apart the luxury segment from the rest of the industry are the driven, passionate, empathetic individuals that make up the team and work tirelessly every day to create unforgettable experiences for our guests. Our guests not only expect to have a clean room, a delicious meal and a flawless experience from check-in to check-out, but also expect to feel an emotional connection with the hotel, which comes from experiencing warm, genuine and anticipatory service from our employees. Rosar: I believe that those who work for luxury hotels have a “sense of pride” to ensure their guests stay is the best one they’ve ever had. The passion and compassion these associates have for making someone’s day better is incomparable. To get up and go to work every day, knowing you can and will make a difference in someone’s life by allowing them to fully relax is worth the hours that we put in. What’s your favorite thing you’ve been able to do in your job? Strout: I was lucky enough to be one of the first employees on property, back when the hotel was still under construction and I had to wear a hard hat and construction boots to work every day. The best part of being one of the first team members is that there really aren’t procedures in place. I had the opportunity to create policies and procedures, train new employees, design collateral and play a big part in how the Sales Team operates every day. Shook: Being a member of our Community Relations team has been something that has been especially meaningful to me. We have been encouraging our 2,000 team members to volunteer in our community and give back in many ways. Last fiscal year, we recorded 13,058 hours! Rivera-Florez: Taking charge and ownership of the new golf store and retail business in the hotel. It has definitely shown me the business [aspect] of retail [as it relates] to the guest experience. We work closely with buyers and make sure that all the product that we have is the right product to deliver the best service that we can. What are the key lessons you’ve learned so far from working in the luxury travel segment? Shook: I’ve learned that every detail in making a guest’s experience special goes a long way, from a simple “Happy Birthday,” to arranging an extravagant excursion. Strout: It’s sometimes better ask a guest if you can take the time to investigate an issue and get all of the answers for them so you can come up with the best solution than to hastily give them an answer or compensation that doesn’t solve the problem. The key is to fully understand the problem so you can do everything possible to make sure it doesn’t happen in the future! Rivera-Florez: Smile. It is the most important lesson and advice you can learn and give. You can’t teach anyone to smile, but if they do it naturally, it’s the most rewarding thing you can give as part of the guest experience. Rosar: Always have multiple alternatives for the guest if you cannot complete their initial request. When people have choices, they feel as if they are in control. How did your experience at Rosen College prepare you for working in the luxury travel segment and your current role? Rivera-Florez: The best lesson that Rosen College gave us is that most of our professors are still working in the industry and keeping up with all the changes that hospitality is going through. It is a [constantly] changing industry and employees, as well as the company, need to keep everything updated as the market evolves. Professors really speak from real experience and not a book lesson. Shook: Rosen College prepared me for my career at The Breakers by giving me the opportunity to have hands-on, real-life experiences. The tools that I learned in each of my classes have carried through into every aspect of my job. I am better educated in several revenue management practices and am able to pick up new responsibilities quickly as a result of my time at Rosen College. Staub: My experience at Rosen prepared me for my role because of the opportunities that were available. From the career fairs to internships and planning real events…Rosen really put things into perspective. Patel: My favorite part about attending Rosen College was the ability to speak with professors for advice and guidance. Smaller class sizes and a separate campus made professors accessible and easy to meet with. Rivera-Florez: Being able to have such a big family in the industry. When you start working in hospitality, you notice how many people you know in all the hotels around the area and around the world. In the future, you are going to be able to network easier and be a part of a new generation of the hospitality industry. What advice would you give to current and potential Rosen College students interesting in entering the luxury travel segment? Rosar: I would ensure they understand that hospitality is not only a career, but a lifestyle. It is fun, exciting and ever-changing. There are many opportunities that will allow you to travel around the world, grow within organizations very quickly and meet incredible people that could potentially turn into lifelong friends. I would also encourage all students to delve deep into the things they find interesting while they have time before they enter their career role, i.e. if you are interested in working in restaurants, work on enhancing your knowledge of wine and food. Staub: I would advise them to intern at a luxury property or to look into a Management Training program. Don’t burn bridges! The person sitting next to you could help you get the job or be your future employer. Patel: Gain as much experience as possible prior to graduation. The luxury segment requires you to have knowledge of all areas of hospitality and having experience in a variety of positions will give you the competitive advantage. Shook: My advice would be to not be afraid to work your way up through the business and to step outside of your comfort zone. By limiting yourself to only accepting management roles right out of college, there are key components to your growth and development that are missed. You never know what is going to end up being your niche until you open yourself up to all opportunities. Strout: A colleague of mine sent out this great quote that I think sums it up: Your smile is your logo. Your personality is your business card. How you leave others feeling after having an experience with you becomes yourtrademark. See original story on UCF Today. For more information about hospitality education at Rosen College, please visit hospitality.ucf.edu.